More Competition for Cow's Milk! Mamma Chia Vitality Granola - Granola's getting a little giddyup: These crunchy clusters have a chia boost! They're also packed with whole grains, protein, and healthy omega-3s. Plus, the stats are pretty impressive for granola. A snack-sized serving (30g; about 1/2 cup) has 120 calories, 4 - 5g fat, 80mg sodium, 15 - 16g carbs, 3g fiber, 5 - 7g sugars, and 5g protein (PointsPlus® value 3*). Find it at select retailers, including Target, or just order online. Chameleon Cold-Brew Coffee and Coffee Concentrates - Premade iced coffee is great, but most are already heavily sweetened and/or have milk added. Not these! Grab a bottle of the coffee or mix the concentrate with water; then doctor it up however you like! In Vanilla, Mocha, and Black, each serving (4 oz. concentrate or 10 oz. coffee) has 0 - 40 calories, 0g fat, 0mg sodium, 0 - 9g carbs, 0g fiber, 0 - 9g sugars, and 0g protein (PointsPlus® value 0 - 1*). Click to locate, or score some online. Introducing: HG's "Shop It!" Page, Featuring HG Lisa's Favorite Finds! For the first time ever, we're making it super easy to stock up on some of our most incredible finds, particularly those that are hard to locate in stores. Our new "Shop It!" page features five of the hottest, buzziest, trendiest items -- hand-selected by HG Lisa herself. From powdered peanut butter to a one-of-a-kind condiment, these are the items every HG fan needs in their life. But don't dilly-dally, because these picks won't be here forever... Every so often, we'll replace them with a brand-new lineup of must-haves. So stock up on the current picks ASAP. You just might discover your own personal "best thing ever." 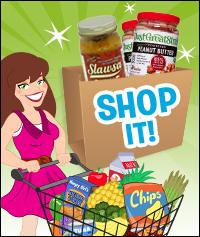 CLICK NOW & SHOP! YAY! Now Trending: HG's Must-Click Picks! If we were to make tweaks to yummy yogurt, how would we change it? More protein, fewer calories, and less sugar. 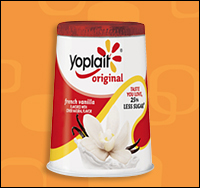 That's exactly what Yoplait is doing to its Original yogurt line. 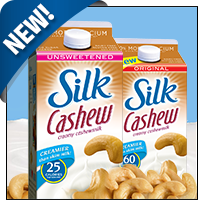 Beginning next month, the yogurt will have 150 calories per serving, plus 6 grams of protein and 25 percent less sugar. Our spoons are ready... ***LIVE FACEBOOK CHAT ALERT: Join Lisa, HG herself, tomorrow (Tuesday, 2/24) at 3pm ET/noon PT! She'll be answering Qs about weight loss, housewalking, food trends, the HG diet, and more... Set yourself a reminder, and be there! ***If you're feeling low on energy, you might need more iron in your diet. The solution? Try these 13 foods high in iron from our pals and partners at About.com Health. Then get bouncing! ***French fries may never grow on trees, but they're getting closer... This Ketchup 'n' Fries plant grows both tomatoes and potatoes, and it's coming to the US this spring! Combining food and multitasking? This is a plant after our own hearts. In the meantime, check out our recipe for Baked Potato 'n Turnip Fries, and grab some Heinz... ***Wanna treat Fido to something special? Introducing Just Right by Purina -- a dog food personalized for your pet's specific dietary needs (with his or her photo right on the bag!). Enter info about your pet at the website, and create a blend perfect for your pooch. WOW! ***And anyone looking to improve their memory may want to add walnuts to their diet. A new study found that subjects who consumed more walnuts did better on cognitive tests than those who ate fewer of the nuts. Just a reminder: Walnuts are full of good-for-you stuff, but they're also high in calories and fat, so enjoy 'em in moderation. Now, where did we put our keys… And that's all we've got. HG out! It's time to share! (Isn't it always, though?) Click "Send to a Friend" now. Speaking of pooches (for those of you who skimmed the Buzz, go back), it's International Dog Biscuit Appreciation Day, February 23rd. We're pretty sure dogs appreciate those any day; step up your game a little with these recipes for dog treats!